Cat shedding is a perfectly normal and expected phenomenon, although it can be confusing and alarming for some pet owners. While certain breeds shed more than others, all cats shed their coats at some point in their lives. This can be frustrating for owners that have to spend time cleaning up loose hair and dander, especially if someone in the home has an allergy to cat fur. Cats that are stressed shed considerably more than a relaxed cat. As such you may notice cats in the SPCA, or animal shelter, shed a lot when you pat them. The same cat, in a happy home, may shed less. A cat with worms, fleas, or lice, will shed more, especially worms. Cats are carnivores, however most commercial cat foods contain a lot of carbohydrates, non-meat fillers. You can look at your dry food ingredient list to see if your food is part of your cats shedding problem. The first ingredient should always be a meat source, such as Chicken Meal, Lamb Meal, or Turkey Meal. Many foods list Corn as a top ingredient, sometimes in more than one spot, thus making corn a major part of the food. Corn is not very digestible to a cat, thus it stresses out their digestive system, and decreases their skin health – thus you have more shedding. As a general rule if a pet food contains “By-Products” it is a lower quality food, one that uses filler. Switching to a better food will not only reduce shedding, the pet will not eat as much and they will poop less too because of higher digestibility. Regular brushing will not only remove any loose hair, it will improve the skin condition – thus reducing shedding. Even patting your cat will improve the condition of the skin. Try to think how many times a day you brush your own hair, a cat will not need to be brushed that often, but once every few days will make a difference. Many people do not even take the time to brush their cats at all, which is why I remind you how often you brush your own hair. Brushing backwards – if your cat allows, will remove more hair. 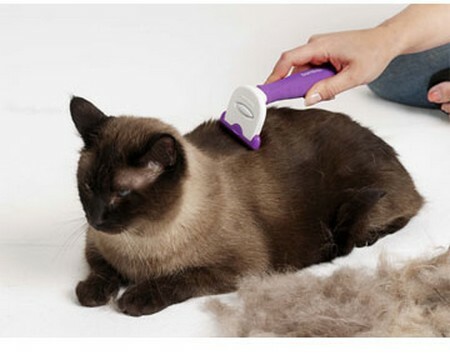 As a last resort a person may wish to have their cats hair shaved. A groomer can do this. It will not reduce shedding, but will make the hairs around your home, much shorter.